For dogs under 20 pounds, Cost is $7. We also take him to Riverside Park, dog run at 72nd Street. The one by Flushing Meadows Park (I forget the street) is very nice for big dogs. spanishfish, how do you get your dog into Manhattan? Train, car (parking)? My dog gets car sick...I can't imagine what a train ride would do. Train usually. He doesn't like the train or the car very much. He's very smart though (aren't they all?) and he's learned to just curl up in a lap (or in the travel carrier) and go to sleep for the duration. He used to have upset stomach problems the first few times we traveled. He hasn't had problems in 4 months or so, so we think he's over it now. there is a also a small one that is basically 10 min walk from here, it's in elmhurst. it's big enough for them to run for a ball or play comfortably. here is the mapquest link.. I moved here from east 54th street in Manhattan, and there is a place over there I still like to take my kids. It's kinda hidden, it's at the end of 51st (right off beekman place for all you Auntie Mame fans) just walk down 51st street to the very end, it looks like a dead end with a wall but on the left hand side there is an opening that leads to a large stone staircase that takes you down to a small public park, which has a very large dog park in it, and the people and the dogs over there are awesome!!!! and it has a great view of the river and the bridge. I haven't heard anything recently, but the last word we had on the project said construction would begin in early 2009. Future Jackson Heights Dog Park! 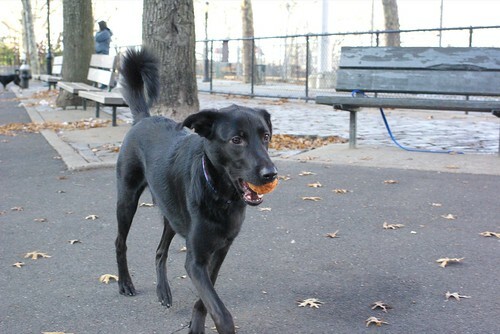 There is soon to be a dog park in Jackson Heights. Actually two! The plans have been developed for individual parks for large dogs and small dogs (at 69th street and 35th avenue) and are going to be constructed in the spring of 2009. I tried to attach the plans, but the file was too large. If you want to see them, or if you know how I can post a larger file, email me (see below for email). The parks will not be huge, but they will be BEAUTIFUL, with different colored gravel, benches, ramps and obstacles for the dogs to play with and explore. Spread the word, so the grand opening of the park will be a great experience for dogs and owners alike. Additionally, the upkeep of the park is up to the users of the park. The plans have been pushed through by a small group of committed dog owners, who would greatly appreciate the help of other caring owners in the area. If you are interested in becoming more involved, please email me at jeffpac09@yahoo.com. Look forward to hearing from, and meeting you. Re: Future Jackson Heights Dog Park! ...I tried to attach the plans, but the file was too large. If you want to see them, or if you know how I can post a larger file, email me (see below for email). ...The plans have been pushed through by a small group of committed dog owners, who would greatly appreciate the help of other caring owners in the area. I'd be happy to try my hand at resizing & posting your file. Also, my wife & I are willing to help with the run's upkeep. E-mail sent. Thanks, Brian. I was unable to view it as sent. It looks good and seeing a plan on paper increases my hope that this will soon be neighborhood treasure. My min-pin will be a happy camper! You're welcome, Liam. I was happy to help. That's great news! We're expecting to move to 72nd street in a few weeks with our (larger) girl, and we're excited that this is expected to be built soon! She loves the dog run where we currently live in Hell's Kitchen. I'l email you privately as well, but we'll be happy to do our part to help with the Run! Marcus, it looks like your girl might be a good playmate for our Blackjack.